Seems like packing for a flight is getting harder and harder. Trying to keep the weight and size down so you don’t have to pay all those airline fees. Making sure you bring what you need but not overdo it. Trying not to forget anything to keep from having to scramble to find a store to purchase what you need. Whew!! Here are a few tips that have helped me to pack more efficiently when I travel and especially when I fly. I make lists for every trip I go on. It just makes sense to know what you need to bring and an itinerary of your trip. I start planning weeks before what I need to pack. Even though some clothing choices will be made when you find out the weather of where you are going. Also, email your flights and itinerary of your trip to family members or friends. While you are traveling, someone needs to know how to get in touch with you. Check to see what your airline charges for check-in baggage. There are some airlines out there that are charging big bucks for your check-in bags. If you are a budget conscious traveler like I am, I shop around for the best flight prices and fees. Early!! 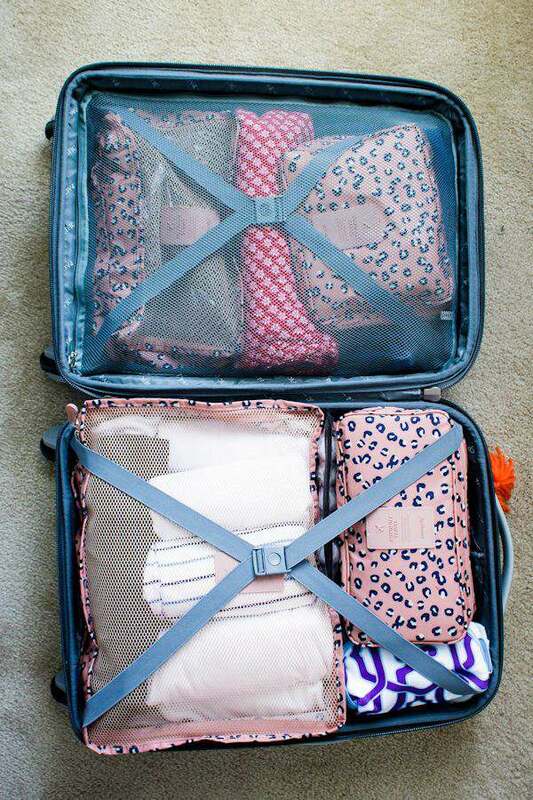 This is a must when packing. Roll your clothes and don’t fold. Tightly rolled up clothes take up less room in your suitcase or backpack. Rolling also causes less deep wrinkles in your clothing. I do make an exception to this rule with blue jeans. I have found out that jeans don’t take up as much room lying flat on the bottom of the suitcase than rolled up. You must follow TSA rules for carrying on items when it comes to the size of your bag and liquids you may have in your bag. All liquids must be in 3.4-ounce bottles or smaller and inside a single, clear, quart-size zip-top bag. I use a clear Travel Bottle Kit that works perfectly for all my liquids. Medications should also be in your carry-on. It’s standard for airlines to allow each traveler to bring one carry-on bag and one personal item onboard planes. Your carry on can be a purse, laptop bag or backpack. Be sure to check with your airline about their rules for these sizes. Electronic devices are normally not permitted in checked baggage. So, you will need to find a bag that all these items will fit in. I use a large camera bag that will hold not only my DSL camera and extra lens but also my billfold, phone, tablet, small laptop, sunglasses and a few personal items I need for the trip. Pick out clothes which can be switched around with other clothing. My foundation color for pants or capris is khaki color and then a pair of jeans. This way I can wear a white or more neutral color shirt with them. I can have 2 shirts for 1 pair of pants. For a pop of color, I will add a light sweater. And a black dress is always perfect for any situation. You can pack 14 days of clothes with only 10 outfits by switching around items. This is essential to keep from paying last minute high fees when you get to the airport. Having an inexpensive luggage scale to use before you start your trip, during and when you are coming home is a must. Your passport, identification, money, credit cards, jewelry, electronics, and other valuables should always be brought onto the plane with you. If the airline loses your baggage, you want to make sure those items are with you. And items have disappeared from luggage before. Packing aids or cubes are a must when you travel and I love them. There are 2 different sizes of luggage pouches for clothes and shoes. They have mesh tops for easy viewing of what is in the bags. The large pouch comes with a zip bag which I used on my last trip to store a shirt that I sprayed with starch and let dry before I packed it. It will keep it away from my other clothes and all I had to do was iron it when I got to my destination. 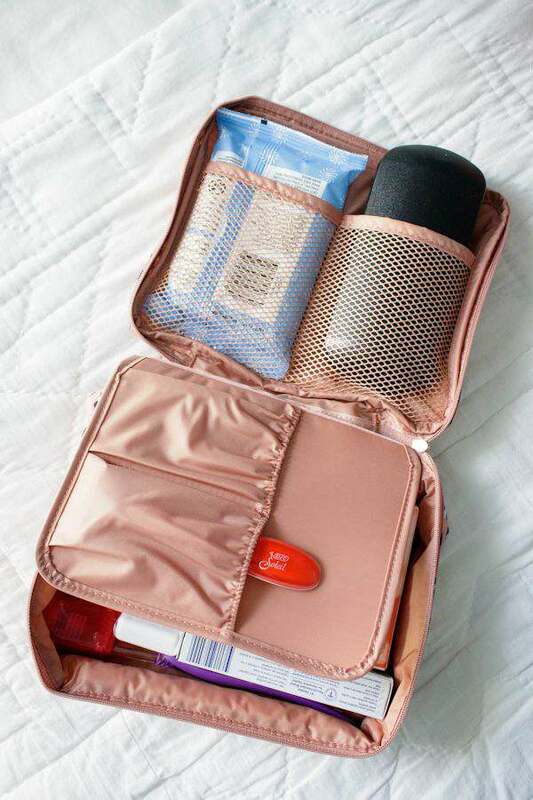 The pouch set also comes with a multi-pouch which holds all my personal care items which feature 2 mesh pockets, 1 removable pocket, and 1 main compartment. This pouch holds all my makeup and anything I need to get ready with. 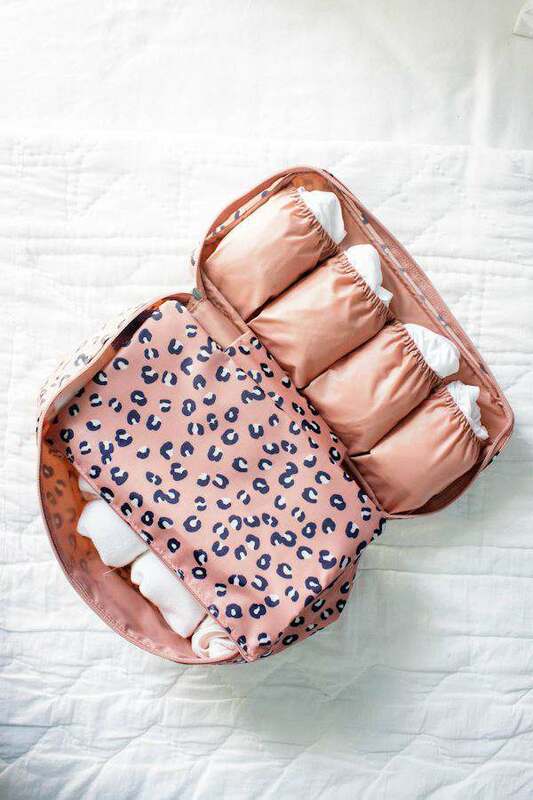 This pouch would be perfect for baby items like diapers and bottles. And finally, an underwear pouch which holds all my undergarments and socks. I love all the small compartments and has a detachable pouch to put your worn undergarments in. This pouch can also hold all your feminine products and up to 6 bras and undies. All pouches have handles on the side and are tear and waterproof and come in several colors and patterns. See how nicely they fit in a suitcase and the best way to keep your luggage organized while you travel. Be sure to check out all of the packing cubes for your next trip. 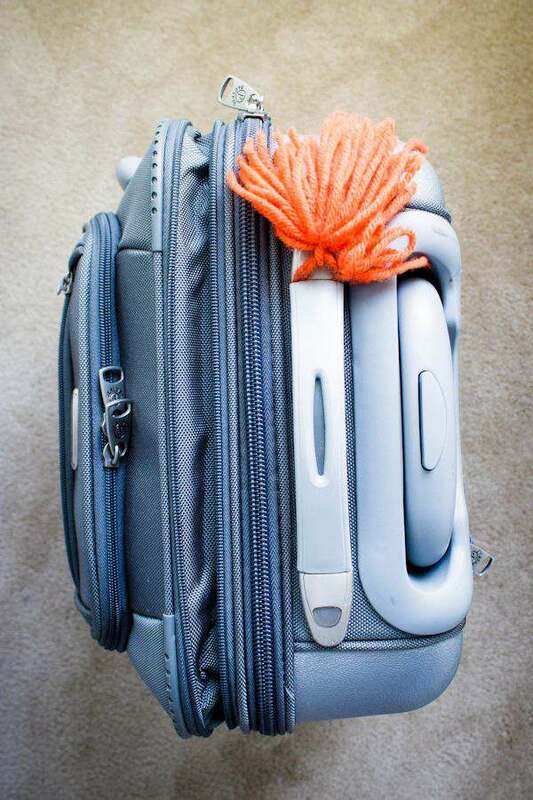 My mom made us a bright orange yarn pom pom to put on our luggage so that we would know our bags when it came out on the baggage carousel. Works perfectly! You could use stickers, ribbons, etc. 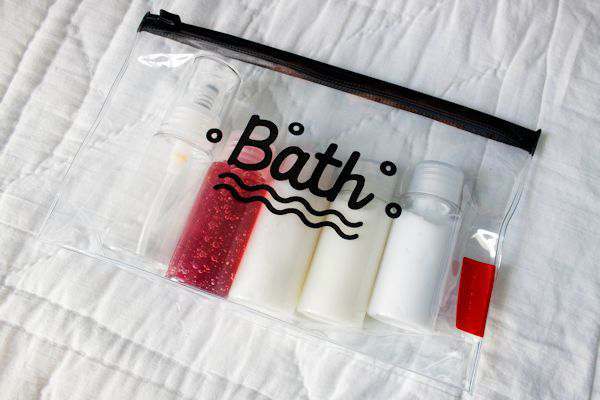 easily to decorate your luggage with. Just in case, check with your airline before you leave on their Lost Baggage policies and what to do. One of my friends was just talking about these!! They are great Jodie. I use them in other places too, when I’m not traveling. Thanks for stopping by. Im actually packing for a trip today! My husband told me this morning that the rental car isnt that big so I need to pack efficiently. Going to use these tricks for sure! Thanks! I am not the best at packing, I always over estimate my needs clothes-wise but I know for the rolling instead of folding! I shall remember all your tips for y next travel! Thank you SO much for these tips. I’m seriously the WORST at packing so I can use all the help I can get. A packing list is a great idea. I always have a hard time packing. I end up bringing way more them I need. You provide some helpful tips. It will urely come handy while packing. I have seen the ribbon trick before and always meant to do it, but the pom poms are GREAT! That is on my to do list now. This is so organized! Thank you for these information. Great tips! I always travel and this is such a nice article for travelers like me. Thanks for the reminders. This is going to save a lot of people a lot of time and money. Nothing is worse than a bad pack job and forgetting stuff. Oh wow I am a frequent traveler but that pouch, never seen, looks super handy! I agree on the tips you shared, especially weighing the bag before. SO important! I’m a terrible packer I have to admit. The last flight I took, I ended up being searched twice because I packed too large of products and it was setting off the alarm. I’m printing your list out for next time. I love the tips in your post. Rolling my clothing and weighting it before going to the airport are some of the tips that I use. Thanks for sharing. What a beautifully packed and organized suitcase. Those little packs are so helpful. I probably need to invest in some. Have been rolling my packed clothes for awhile and it does make a huge difference, wrinkle-wise. It seems I pack too many dressy items for the kinds of activities we tend to do. I need to remember that and add more comfortable pieces. Appreciate your suggestion about making a list of what to pack. I tend to do a lot of thinking about it but writing a list would keep me from thinking and worrying and dwelling on my packing. Will try to remember that for the next trip! Those are really great packing tips!! Keeping these for future purposes!! Those are some great travel tips. I have seen people rolling clothes before but was always curious why. Thanks for the great information here. What a great list! I consider myself a pretty good packer (with two kids and flying twice a year, I’ve had to be). 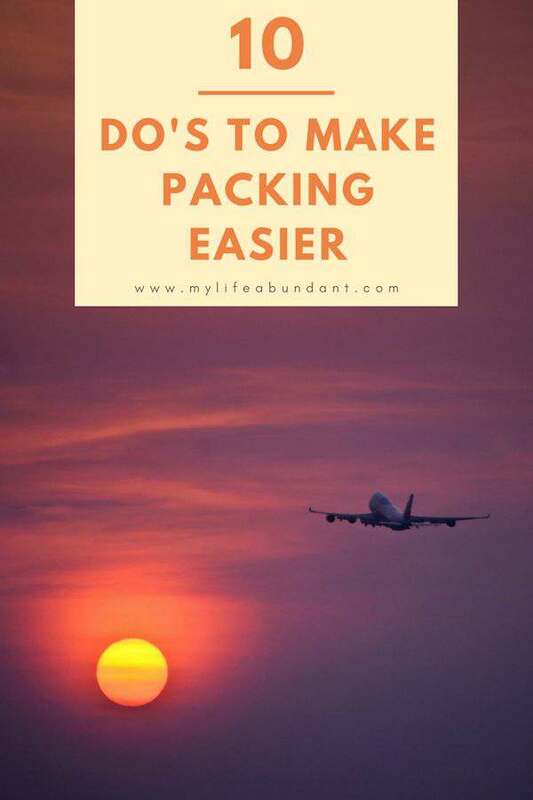 These are great tips to make packing easier. I need to remember to roll, not fold! Marking my luggage is a must. I love your little packing pouches I want to invest in more packing cubes. I almost always make a list of things to pack since I pack for a family of 5! I usually mark my luggage AND buy luggage that is eye catching. I have to say that the baggage fees drive me nuts. It makes little sense. The first one or two bags should be free not costing an arm and a leg. However, thanks for sharing some great tips!